Kiva’s partner in South Africa, Women’s Development Businesses (WDB), serves rural women throughout the southern portion of Kwazulu-Natal. In this region, Zulus make up the strong majority of the population, particularly in rural areas outside of Durban and Richards Bay. 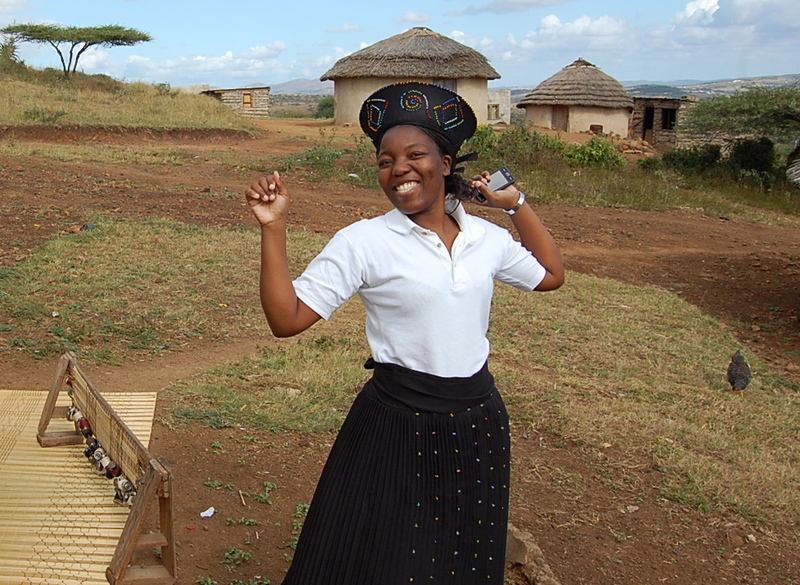 One of the most popular methods for WDB’s clients to earn income is by using the loans to buy materials to make mats, clothes, and jewelry for traditional Zulu weddings. Weddings in any culture are complex affairs filled with symbolic gestures and ornaments, and Zulu weddings are no different. I’ve not yet had the pleasure of attending a wedding in South Africa but two future brides-to-be, WDB’s Kiva coordinators Smah and Gnile, walked me through a typical Zulu wedding and explained the role of the mats, clothing, and jewelry. Learning about Zulu weddings has provided me with insight into the changing nature of Zulu culture, and I thought it would be a good thing to share on the Kiva Fellow’s Blog. The wedding ceremony begins early in the morning, when the bride-to-be arrives with her family and bridesmaids at the groom’s house with a symbolic box (in Zulu a “kist”). This box is filled with her belongings. The kist symbolizes her coffin, as she is now preparing to live the rest of her life in her groom’s home. Upon her arrival, she walks around the livestock pen of her groom’s home accompanied by her wedding party. During this procession, an elder from her wedding party recites a chant, asking for acceptance from the ancestors buried in the groom’s lands. After this first ceremony, a white or modern wedding takes place at a nearby hall or outside in a large tent. Over the last several decades, white weddings have gained popularity within Zulu culture with the spread of Christianity. These weddings are familiar to most western cultures: the bride wears a long white dress, the groom wears a suit, a pastor recites vows in front of a large congregation, and a reception takes place with a large white cake and speeches by the bride’s and groom’s families. At the end of the white wedding, the wedding party moves from the hall to the groom’s home for a traditional Zulu wedding. For this, the bride wears the clothing and jewelry made by many of WDB’s clients (see photo). The groom wears a traditional outfit made primarily from animal skins. A Zulu elder oversees the ceremony, which is conducted in a field near the groom’s home. With their families and villages watching, the elder asks the bride and groom the simple (or very complicated, I guess) question of whether they love each other. After both confirm their love and devotion, the bride sticks a knife into the ground as a symbolic gesture of her acceptance and the marriage is official. 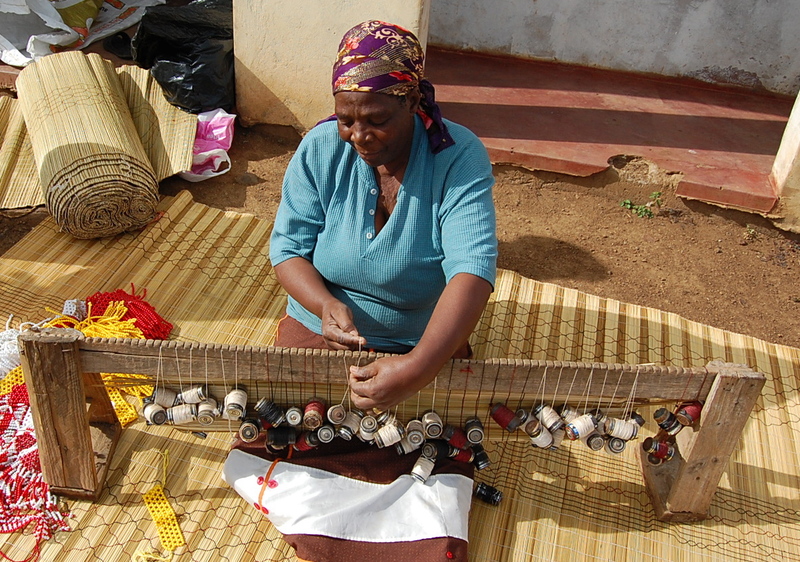 Kiva borrower Elpha, the leader of the Phelelani Group, demonstrates weaving techniques to make traditional Zulu mats. Finally, the bride gives traditional mats and blankets to the groom’s family as wedding gifts. These mats are handmade from tall grass found along river beds with a manual wooden loom (see photo) and are usually used as bedding in rural homes. The groom has given gifts to the bride’s family before the wedding has taken place, usually in the form of cash or livestock. It is important to note that all Zulu weddings follow this pattern. Some Zulu couples only have a white wedding or a traditional Zulu wedding, depending on their beliefs, finances, and personal preferences. Younger Zulus tend to prefer white weddings even though they are more expensive than traditional weddings. It is also important to repeat that all the information that I’ve written above comes from the staff at WDB offices, particularly Smah and Gnile, the two Kiva coordinators. Smah plans on getting married to her fiance by the end of this year in a white wedding. Gnile plans on getting married to her boyfriend next year and will have both a white and traditional wedding. Zulu weddings are a fascinating example of the blending of modern and tribal culture that exists throughout South Africa. Daniel Jung is a member of KF15 and works with Women’s Development Businesses (WDB) in Richards Bay, South Africa. For more information about WDB, check out its website. Also, join the WDB Kiva lending team here. Entry filed under: KF15 (Kiva Fellows 15th Class), South Africa, Womens Development Businesses (WDB). Tags: blogsherpa, Kiva, Kiva Fellows, KwaZulu-Natal, South Africa, Travel, Zulu. Daniel, this is really incredible. I’ve found that weddings are one of the most fascinating cultural exchanges abroad (for example, carrying bags of 400 oranges to a K’iche’ wedding in Guatemala…). Anyhow, hope you get the chance to attend one, and great post! Thanks, Kate! I totally agree. I couldn’t stop asking questions about Zulu weddings to my co-workers because it was so interesting. I hope to attend one too! Nice post. Great photos. Fab hat! Thanks for letting us in on this tradition. I always love hearing about how other cultures handle things like weddings. No problem, Jenn. Zulu culture is really interesting, especially in the context of South Africa’s history. I am really happy to be here and be able to share!